The Pyrenees mountain range runs right through the south of France and northern Spain, and is renowned for its stunning scenery. Bielsa is a small town situated on the western slopes of the mountains that form part of the Ordesa National Park in Spain, making it an ideal base if you enjoy hiking. The National Park was first established in 1918 and originally covered an area of 21 kilometres. It was specifically set up to protect the distinction of the Ibex (or wild goat) which sadly is still in decline. Today it now incorporates 156 kilometres and draws in huge numbers of visitors because of its beautiful flora, lush forests and wildlife. Wild boar, otters, and chamois deer can be seen roaming through the Park. There are still brown bears, one of Europe’s most threatened species, in the more remote parts. Thankfully, as they have a healthy fear of humans, unless provoked they tend to run away rather than attack. The park is particularly popular with bird watchers as well, for there are over 170 different species, including the Golden Eagle and the spectacular Bearded Vulture with a wingspan of 3 metres. A Karstic limestone layer, lifted from the seabed over 50 million years ago, covers the park. The Ordesa Valley was carved by glaciers, with cliffs on either side that rise over 800m high and dramatic Canyons formed by the rivers slowly eroding the soft limestone. The limestone folds are streaked with glorious colours of red and yellow, and the valley eventually ends with a glacial cirque called the Circa Soasa. The National Park is open between May and November, and the most popular time to visit is mid July. There are a variety of hiking opportunities ranging from easy and short, to quite challenging. The most popular walk is the Circa Soasa which takes anywhere from 5 to 8 hours to complete. For the more experienced climbers, there is the Petit Vignemale and Aquisclo Valley climbs. The Valley floor is 16km long and takes up to 7 hours to walk. There are several routes you can follow. The Faja de Pelay is a spectacular path on the southern cliffs of the valley that takes up to 9 hours to walk. If you walk the Faja de las Flores you must not forget to take your camera. Although it is said that photos will not do it justice. This particular walk is 16km and takes about 10 hours. Finally, the Faja Racon is another one you should not miss. It is 11 km long, runs directly underneath the cliffs, and takes about 5 hours. Monte Perdido is the third highest mountain in the Pyrenees, and referred to as the Lost Mountain. 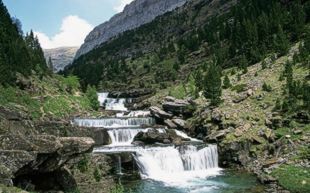 Located in the Huesca Province of Aragon, it forms part of the Ordesa y Monte Perdido National Park. For the more serious climber, the route starts from the village of Torla, taking you to the summit which is over 3,300m up. It is a dangerous climb though if there is snow about. 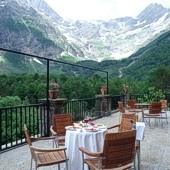 The Parador Bielsa is a small three star mountain hotel set right in the National Park with lovely views of the mountains. With its wooden floors and luxurious decor, it provides a very comfortable atmosphere. 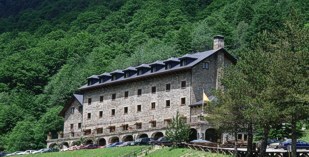 It also has a superb restaurant that serves popular regional dishes, typical of the north of Aragon. It is definitely a welcome site and the perfect place to relax after a full day of walking or climbing.